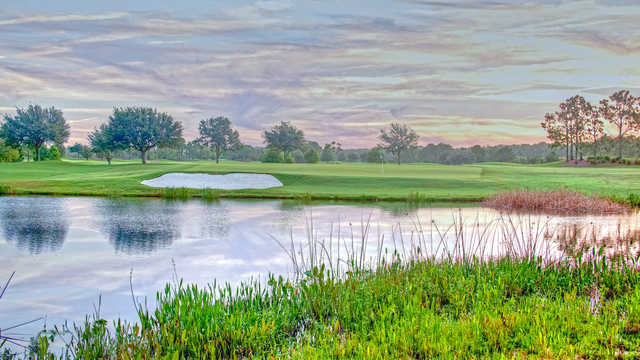 The ancient creek that the course at Shingle Creek Golf Club takes its name from is part of the natural headwaters of the Florida Everglades. The creek winds through the golf course, adding beauty and an interesting element of challenge. Stately oaks and pines are scattered throughout and accented by tropical landscaping. The course features wide, undulating fairways lined with trees and fast greens. The interconnected waterways present on the course form water hazards that come into play on nearly every hole. There are also strategically placed bunkers throughout, especially around the fairways. 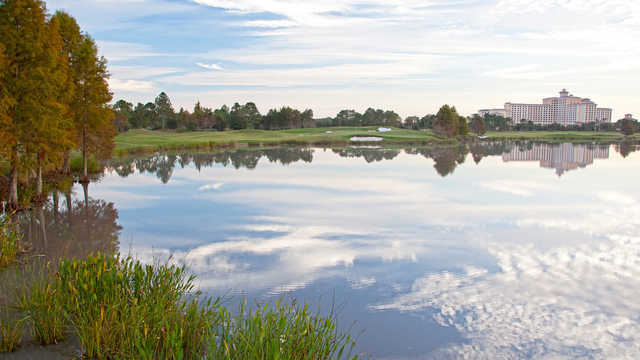 The Shingle Creek golf course also offers five sets of tees for a variety of different golfing options. 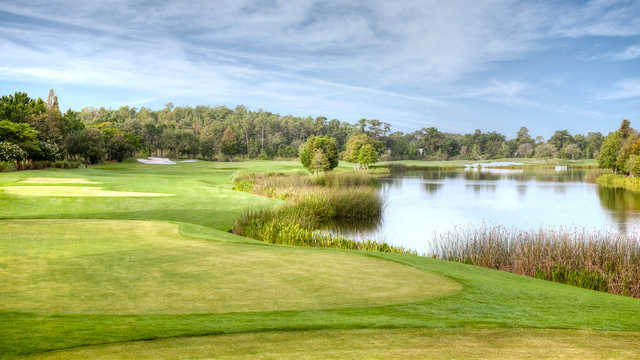 If you haven’t played Shingle Creek Golf Club in Orlando in a few years, you’re in for a rude awakening; but it’s all good. If this is your first time playing the course, you’ll absolutely love it! 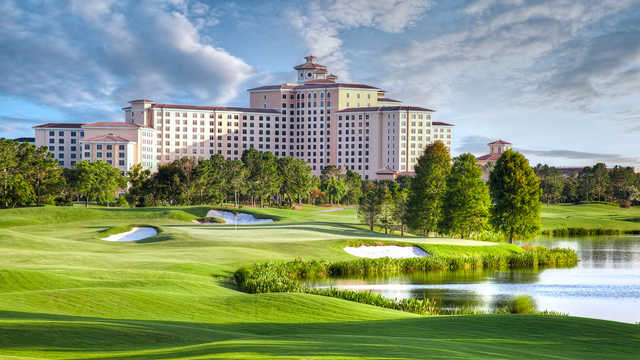 The course originally opened for play in 2003 and was designed by Dave Harman; it’s the centerpiece of the 5-star Rosen Shingle Creek Resort, which opened in 2006. The resort features 1500 rooms furnished with luxurious appointments and accommodations, nine dining venues, a full-service spa, 4 swimming pools, tennis, beach volleyball, basketball and much more. In 2016, the golf course underwent a complete renovation. Some holes were remodeled, other holes were rerouted and new holes were added. The result is a golf course that is a lot more player friendly and every bit – if not more – beautiful than it was in its original state. The Arnold Palmer Design Company oversaw the restoration of the golf course with the goal of giving the course added variety and adding certain elements of strategy in order to post a low number. The service afforded to both golfers and resort guests is evident the moment you arrive. Attendants greet golfers at the bag drop and direct them to the stylish clubhouse which includes a spacious, fully stocked pro shop and a restaurant/lounge with comfortable seating and a wonderful golf-centered atmosphere. Lunch is served daily and an early dinner menu is available as well. Should you find yourself with an early morning tee time, the Partake Café offers fresh baked danishes and muffins as well as the highly esteemed Par-Take Breakfast Sandwich. All of your favorite libations and soft drinks are available as well as fresh made deli sandwiches, hot dogs and burgers as you make the turn, which is now after the 7th hole. Men’s and women’s locker rooms are also located in the clubhouse and feature private shower stalls, sitting areas and dark cherry wood lockers. Shingle Creek Golf Club is home to the Brad Brewer Golf Academy and is one of the nation’s best golf instruction facilities. Brewer has received numerous awards and recognition, including a top 100 ranking by Golf Magazine; he’s also a PGA Class-A Professional. The Academy recently added a short-game area and as a result, the practice area has doubled in size. They’ve also installed new state-of-the-art swing analysis equipment and game improvement technology in the indoor hitting bays. Before your round, be sure to take advantage of the well laid out practice facility which is included with your greens fee. The practice area has a spacious driving range where you can hit every club in your bag to your heart’s content, a short game area with a practice bunker and a good-sized practice putting green. A lot of players have difficulty chipping from closely mowed grass around the green. If this describes your game, you may want to get there early and spend some extra time at the practice facility practicing these shots; they will come in handy on the course. From the back (Black) tees, Shingle Creek plays 7,213 yards. Unless you’re a scratch golfer or close to it, it may be best to move up. From the back tees, the shortest par 3 is 190 yards and the longest is 244 yards; a good drive for many players! I found that the Blue Tees (6,213 yards) were a fair test for my game; I was able to enjoy myself and still leave with a little respect! 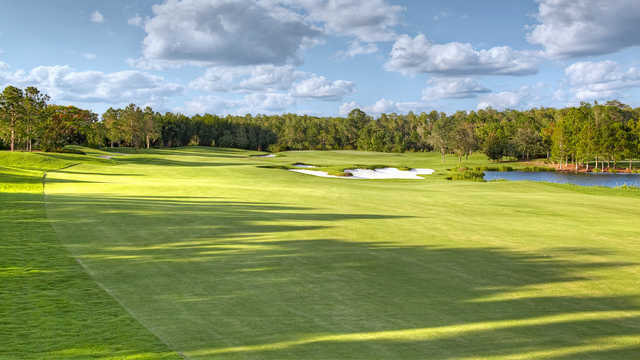 In all, Shingle Creek offers golfers five sets of tees with yardages measured at 7,213 yards, 6,600 yards, 6,213 yards, 5,582 yards and 4,945 yards. Choose the set that best match your game and you’re sure to have a good time. 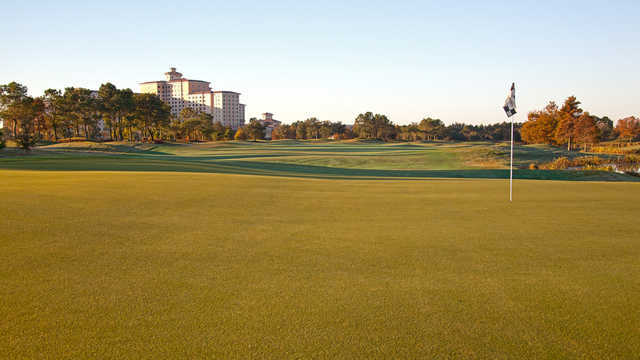 Although the fairways at Shingle Creek are, for the most part, wide and provide generous landing areas, they have a lot of roll to them which can create challenging lies. The greens put fast and true, some with dramatic sloping from back to front. Depending on the mood of the greenskeeper and his decision on where to place the flags that morning, there can be some very challenging pin positions on some of the greens. Even a short putt can have plenty of break. Some of the most memorable holes on the golf course are the par 5s. It all starts on the 2nd, known as Ismael’s Gift, which plays 506 yards from the Blue Tees. Depending on how far you can hit the ball off the tee, you may want to consider trying to carry the coquina shelled bunker that protects the left side of the fairway. Not only is it the shortest distance to the green, it also sets up the best angle into it. Beware of the pot bunker that occupies the middle of the fairway about 60 yards short the green. Your pitch shot will require a deft touch; the green has a large false front on and the rest slopes towards the back. The 8th hole, Handshake, was one of the reconfigured holes. It was lengthened tremendously and now plays over 600 yards from the back tees, easily the longest hole on the course. The safest line is down the left side, away from the lake on the right. This will leave the best angle into the green, although for most players it is still a 3-shot hole. Playing down the right side is definitely shorter and the closer you pay to the lake, the easier your next shot becomes. A word of advice: Play down the left side for a front left pin placement. The first par 5 on the back nine is Number 13, nicknamed Skillit. This 570-yard par 5 is one of the new holes and brings a canal into play down the left side. The big decision on Skillit is on the 2nd shot: play short, play left or carry the fairway bunkers. Successful navigation of your second shot will leave a delicate pitch shot into a deep narrow green with the canal to the left. Miss the green right and you’ll leave yourself a challenging up and down. Miss it left and simply finding your ball can be an arduous chore. Number 16, Emma, is a reachable par 5 that plays 447 yards from the Blue Tees and offers a lot of room off the tee. Success on Emma is determined with your approach shot. There’s a small mound that juts into the front center of the green and separates it in two. You’ll want to find the side of the green the pin is on with your approach shot in order to avoid a challenging recovery. Another hole worth mentioning is Number 14, is a short risk/reward par 4, aptly named Roulette, that plays 276 yards from the Blue Tees. A well struck tee shot can easily reach the green, but with water making up the entire left side, you have to ask yourself: “Do I feel lucky?” Plus, there’s a nasty little pot bunker guarding the front of the green. 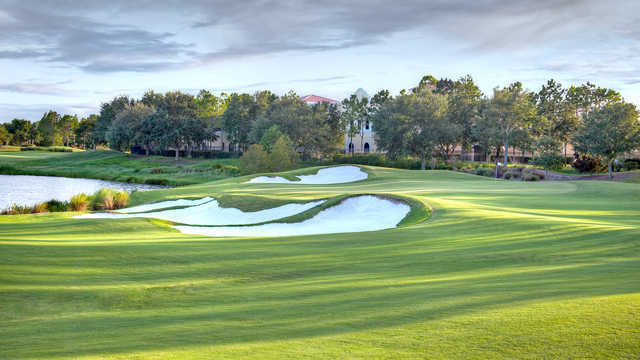 Last Word: What you’ll now find at Shingle Creek is a course that is a lot more forgiving and player friendly for the average player, yet a lot more challenging for the skilled golfer. This is because of the thought process now involved in playing the course at a high level. The average golfer can come out and take advantage of the wider fairways off the tees, and the long par 4 and 5 holes provide ample opportunity to recover from an errant shot. The skilled player will now be required to bring their “A” game, one that is a lot more exacting if he/she wants to post a low number. Both types of players will relish in the natural beauty of their surroundings. Bunkers are more visible and seem to be strategically placed in landing areas. The greens feature a good variety of slopes and undulations and range in size from small to extremely large. 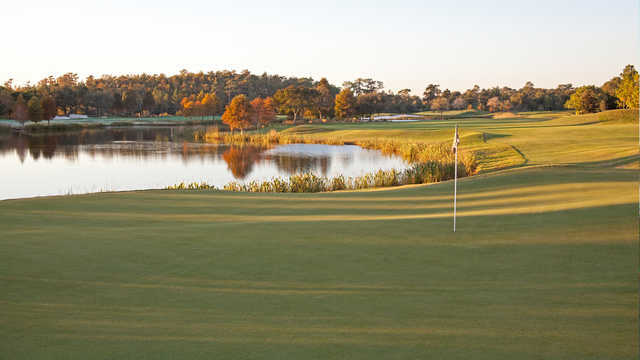 All in all, Shingle Creek is one of the best rounds of golf you can play in the Orlando area and can provide a change from the theme parks. 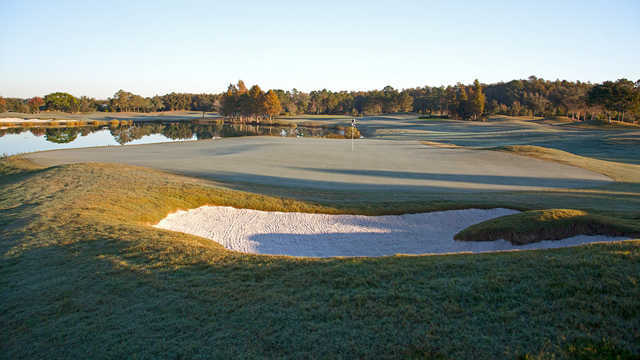 Shingle Creek offers some tremendous Stay and Play opportunities that include accommodations, two rounds of golf and complimentary shuttle service, all for one low price. There’s also a Golf & Grub special which includes a round of golf, cart, range balls and lunch for $99. 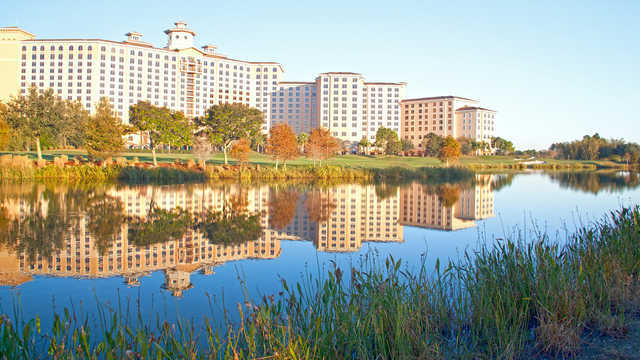 Stayed and played at Rosen’s Shingle Creek, I would highly recommend this package, as the hotel is very nice and the golf course was fun to play. Everyone from the hotel staff, pro shop employees to golf course starters were very knowledgeable and friendly. The only complaint I would have, is the driving range was in pretty rough shape. I played the course four days before they aerified. The conditions were above and beyond. I can't wait until it heals up. I will definitely be out there again! Could possibly have the best conitions of any course in Orlando. When the course has been allowed to dry its a pleasure and challenge for all levels to play.